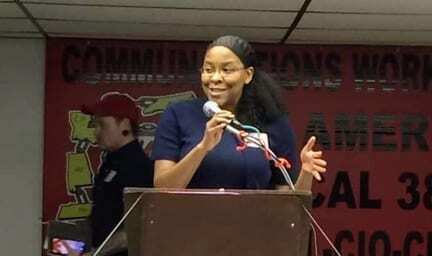 Lakenya Middlebrook, President of the Knox County Democratic Party presiding over the convention after being sworn in. Photo submitted. KNOXVILLE, TN — Lakenya Middlebrook raised her hand on the last Saturday in March and as she was sworn in, made history as the first African American to hold the position of president of the Knox County Democratic Party. “I am delighted and pleased for this historic day. I have been saying for years we need to expand our base and our leadership to reflect the total community. Lakenya is more than qualified to lead the party. She has been active for years in the campaigns of those running for office and she relates well with the NAACP. She is local, Knoxville born and Knoxville bred.” I am excited to see this younger generation offer themselves up to serve. Indeed the new officers are all between the ages of 30 and 45”. Lakenya, is herself under 40 and received rousing support from long time party leaders, among them Linda Haney who is a past president and was recently a candidate for mayor of Knoxville. Haney expressed great confidence in Middlebrook and all the new officers. President Middlebrook, when asked about her new position and vision for the party did not hesitate with her answers and her goal of uniting and growing the party. She said, “We are excited for the opportunity. The new leadership is bringing in a lot of energy. The issues of the community are important. It is wonderful to see the great things that are coming from the infusion of young people; many have been in the political realm since childhood and in college, and are now taking on leadership roles.” President Middlebrook did not discount the knowledge or years of service of the past leadership, “We are going to take a multiple generation approach and tap into the institutional knowledge of all members.” We have a goal of getting more democrats elected and to do that we must move at a faster pace to grow the organization. “If your organization isn’t getting any younger, you have a dying organization”. She emphatically had this to say: “Our progressive voices will be loud and heard”.